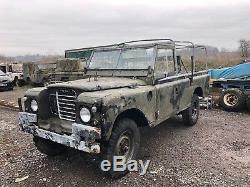 Land Rover has been in storage since around 1994, mainly in a barn, but the last few years it's been outside. 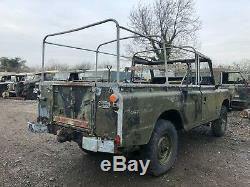 General description; the chassis on the whole is pretty good, apart from parts like the rear cross member (which will need replacing), one central cross member (will also need replacing) and there are some small holes in the underside of the front legs. Of course, there will be more, but it's not too bad and definitely worth the welding. 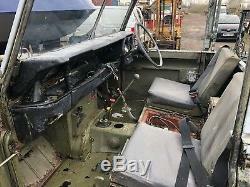 The bulk head will need two footwells, and some attention to the door posts. 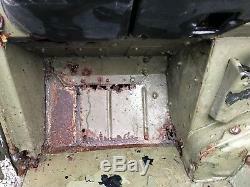 Also, the offside bonnet hinge area is rusted and the top of the vent apertures will need some TLC. The engine starts and runs very nicely, it is smooth and quiet, though the heater is disconnected and the heater control valve is missing. The axels look complete and have leather military covers on the swivels, this usually keeps them in good conditions so I'm presuming they're okay. The springs, thankfully, are not rusted and spreading which is a good thing. 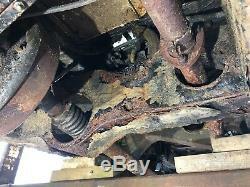 Clutch works and I've been able to drive it around the yard through all gears which seem to work okay, without any excessive noise, although reverse is a little bit whirry, but this does not seem excessive. 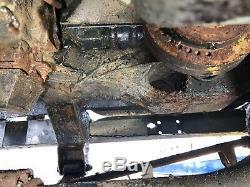 The brake pedal moves and the rear brakes appear to be doing something, though the front brake lines have rusted and are leaking, so I can't tell if the front brakes are doing anything, but it does roll freely and the brakes aren't binding. The dashboard is not quite complete, it is missing the clock with the fuel gage and temperature gage in it, and some other small bits including a convoy light switch. The mileage reads 67,141. 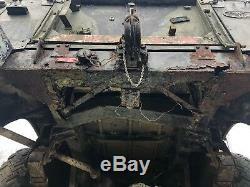 Body work; I've scraped and steam cleaned off the military paint so we are mainly down to it's original coat of paint. Front panel looks okay, front wings are both a bit bent (but serviceable). All the lights will need to be looked at. Doors are not the best (but serviceable) including anti-burst door catches. The NS door top will need replacing. I don't have the keys for these doors Rear body is pretty straight but has many layers of paint inside the back. 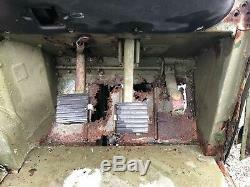 Rear tailgate needs NS hinge. I do have the original military release document, of course this will be needed to apply for a V5 when you're at that stage. It was released from the military in 1994. Unfortunately I don't have any keys for it. 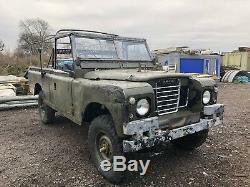 I reckon this Land Rover is an ideal base for a rewarding project and well worth the time and effort it'll take to get it back on the road. I also have more photos I can send if required. 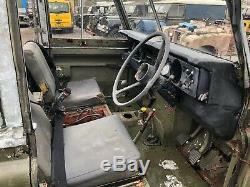 The item "Land Rover Series 3 LWB 24V FFR Project" is in sale since Thursday, January 31, 2019. 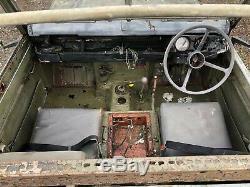 This item is in the category "Cars, Motorcycles & Vehicles\Military Vehicles". 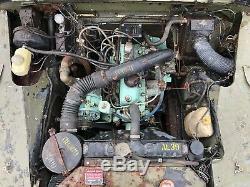 The seller is "wica-6258" and is located in Melksham. This item can be shipped to United Kingdom.